Layaway is a great way to spread out the spending for the Christmas season. It also insures that you will get that item which will be difficult to find if you make your purchase early in the shopping season. Layaway has always been a thrifty way to shop for savvy shoppers. Most stores do allow items on sale to be included in your layaway but check with each store for their policy. Below is a list of major retailers who have layaway policies. Be certain to always check with your store for their particular policies prior to making your layaway. I consider K-Mart and Sears to be great American retail icons which it would be great to see thrive in America. Both stores carry a wide array of products and services which make them great places to shop. K-Martoffers 8 week and 12 week payment options. With the online option, you can shop online and pick up in the store! So convenient. Either way, you can make payments easily online. You can cancel any layaway contract and receive a refund of any payments made minus the Service and Cancellation Fees. K-Mart also offers a calculator online to help you calculate your spending. Sears also offers either 8 week or 12 week options for layaway. 8 Week layaway service fee is $5, Cancellation fee is $15. Down payment is either $20 or 20%, whichever is greater, and then 4 payments will be required, bi-weekly. 8 week layaway is available both online and in the store. 12 week layaway service fee is $10 with a $25 cancellation fee. Down payment required is $35 or 20% whichever is greater. 6 bi-weekly payments are required. 12 week layaway is available in store only. Walmart is getting back into the layaway market this Christmas season. Please be certain you go here to read their layaway policy! There are a lot of rules involved. It may take up to 10 days to receive your layaway after final payment is made. This is because they are storing layaway’s off their premises. Final pick-up date is still December 13th. In stores only, not available for online shopping. There is no opening fee which is nice. Their down payment is only $10 or 10% whichever is greater. Cancellation fee is $10 with all payments being refunded minus the fee. All items must cost a minimum of $15 with the minimum layaway being $50. Although you must stand in line at the layaway counter to originally put up your layaway, you can then make payments at any register. Layaways not picked up by December 13th will be cancelled so be mindful of this. Also layaway is NOT available on Black Friday, Nov. 29th. Important notice, all layaway items may not be stored in the store therefore it may take up to 10 days to pick up your layaway after final payment is made! 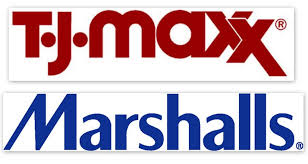 TJ Maxx and Marshalls both offers a 30 day layaway at some locations.Their policies are the same. 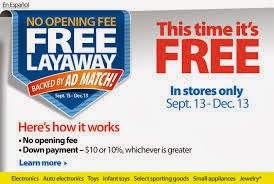 Check with your local store to see if they are participating in layaway. There is a minimum payment of $10 or 10% down, whichever is greater. There is a non-refundable $5 layaway fee. The Cancellation fee is also $5. Please share, in the comments section below, any major retailers you are aware of who have a layaway policy for the Christmas season this year. Have fun shopping!